Groundhogs are tunneling animals that frequently find their way onto different parts of residential property and dig tunnels. Often times the groundhog tunnels are found near a homes foundation and the groundhogs must be trapped before costly damage is inflicted. Keeping your family and private property safe is very important to BWS pros. We are small enough to care yet big enough to serve. Call us today! Homeowners in Columbus, OH often need groundhog trapping services to get rid of nuisance groundhogs infesting different parts of their property. Buckeye Wildlife Solutions uses humane means of groundhog control. Our custom made cage traps are made to impose little stress on captured animals. The covers we implement on the outer layer of the traps helps protect the groundhog from the burning sun during summertime, as well as rainy conditions. 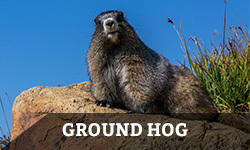 Groundhogs often create their burrows under or around decks, patios, porches, & foundations. Damages can be concerning at times when groundhogs are digging around foundations in particular. With the extensive tunneling systems groundhogs create, the presence of burrows near a foundation can potentially cause water leakage through the foundations cement. In addition to damages around the walls of foundations, groundhogs will also chew threw underground wiring & irrigation systems. An average groundhog excavates 750 LBS of dirt per den. Groundhogs generally have 4-5 den sites per territory. During the winter months groundhogs hibernate 5-8ft down in their burrows. The current record of depth a groundhog has been discovered hibernating is 25ft down into the earth. Once springtime rolls around the groundhogs enter their most active months of the year, mostly due to mating season, leading up to female groundhogs giving birth.